Speichern Sie den Artikel devolo Home Control Radiator Thermostat in einen vorhandenen Merkzettel oder erstellen Sie einen Neuen. Fits all current radiators. Simply replace conventional radiator thermostats. Ready to use in no time: can be installed easily, without special tools or expertise. Connected via Z-Wave® wireless technology to additional devolo Home Control components. The devolo Home Control Radiator Thermostat is absolutely future-proof thanks to the standardised Z-Wave® wireless technology and can be combined at any time with additional devolo Home Control components. In addition to the heat, you can also control motion sensors and smoke detectors, switch electrical sockets or identify opened doors and windows using the Home Control Central Unit. Whether you are using the entire home automation system or only the radiator control makes no difference for operation − the handling is a breeze in all cases. 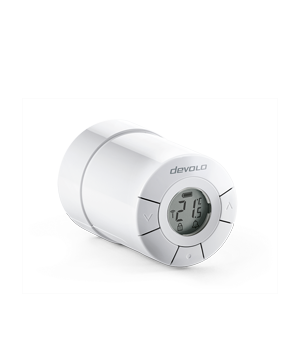 You receive a three-year warranty from us on the devolo Home Control Radiator Thermostat. With these strong Smart Home partners, your devices will become even smarter! The path to voice control is simple: devolo home control owners only need a Google Home or Google Home Mini Smart Speaker. "Alexa, meet Home Control. Home Control, meet Alexa." Believe it or not, getting the Amazon Echo device to recognise our Smart Home system is that easy. The smart lighting control from Philips Hue® lets you configure the best ambiance in light in your own home with ease, flexibility and maximum convenience.